Photo from the debut of the William & Mary Hip Hop Collection on April 19th, 2013. 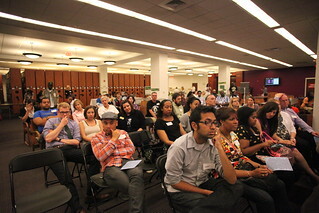 The launch events included hip hop-related film screenings, panel discussions, and entertainment by DJ Wyze. Established by Swem Library’s Special Collections Research Center, the W&M Hip Hop Collection is the most comprehensive collection of its kind dedicated to Virginia hip hop culture and history from the 1980s to the present. In addition to preserving Virginia’s hip hop past, the collection documents the origins and impact of hip-hop culture on college campuses throughout the state by collecting records of hip hop-based student organizations, college radio stations, events and concerts with a special focus on William & Mary. The launch event was co-sponsored by Africana Studies and the Mellon Grant for Global Studies, Literary & Cultural Studies, Film Studies, American Studies, Department of History and Department of Music. For more information, contact Swem’s Special Collections at 757-221-3094 or spcoll@wm.edu or follow us on Twitter @HipHopWM or @SwemLibrary.